Sixties soul meets modern man. Just before Christimas 1984, Chris Lowe and I (otherwise known as the Pet Shop Boys) spent a couple of days writing and then recording a demo of a new song  a duet called ‘What Have I Done To Deserve This?’ (Look columnist Philip Norman will be relieved to learn that this process involved sustained concentration, considerable hard work and much fun. 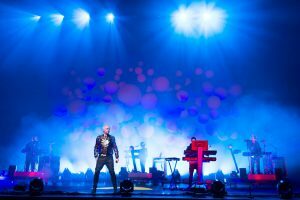 According to his feature of three weeks ago, he is under the impression that pop songs nowadays are written by computers.) Working with us was an American songwriter called Allee Willis  a successful one, with hits to her credit such as ‘Boogie Wonderland’ for Earth, Wind and Fire. A year later, ‘West End Girls’ had given us our first hit, and we were beginning to record our debut LP with producer Stephen Hague. We planned to include ‘What Have I Done …?’ but it presented us with a problem. Who would we get to sing the other half of the duet for the real thing? Various notable female contemporaries were suggested, but none sounded right. We wanted a woman with a voice suggesting both experience and vulnerability, warmth but also a tough take-it-or-leave-it atitude. The song is neither teenage romance nor nostalgia, but a dialogue about the end of an affair between two adults. Nikki, our manager’s assistant, had a bright idea. In interviews, I had occasionally mentioned Dusty In Memphis, a 1968 album, as my favourite LP. It’s the album which best captures her heart-breaking voice withing a soul context (Jerry Wexler, Aretha Franklin’s producer, supervised the sessions), and it established Dusty as the only authentic white female soul singer of the era. Before this album, she’d had a string of pop hits  ‘I Only Want To Be With You’, ‘I Just Don’t Know What To Do With Myself’, ‘You Don’t Have To Say You Love Me’, ‘I Close My Eyes And Count To Ten’. Her breathy, glamorous voice was always thrilling, even when the ’60s pop industry tried to cram her into a conventional show-business, cabaret career, alongside Cilla Black, Lulu and Anita Harris. And, like every great pop singer, she had more than a great voice; she had a look – the blonde bouffant hair-do, the black eye make-up … acres of it. Since Dusty In Memphis and its hit single, ‘Son Of A Preacher Man’, her career seemed to tail off. She made a few albums in the ’70s and moved to America. She wasn’t forgotten, of course. Elton John still eulogised about her; so did Elvis Costello. But her latest album wasn’t even released in Britain (although it included an Elvis Costello song). An abortive contract a couple of years ago with Peter Stringfellow’s Hippodrome label produced just one disappointing single, ‘Sometimes Like Butterflies’. By 1985 Dusty Springfield was merely a legend. Rumour had it that she was a recluse in Los Angeles, surrounded by cats, impossible to work with. A tape of the song was dispatched to her manager in the States. The answer came back weeks later: no, she’s not interested. The song was not included on our first LP. Then, several months later, her manager phoned our manager. She wants to do it. Do they still want her to do it? Yes, we did. Then? Eventually, just before Christmas last year, Dusty Springfield flew from Los Angeles to London to record with the Pet Shop Boys. ‘Jerry Wexler said she was without doubt the most difficult singer he’s ever worked with,’ a journalist friend informed me helpfully. ‘Of course, her voice isn’t what it was,’ another friend declared authoritiatively. She arrived at the studio on time, in a black leather designer jacket and high-heeled boots, with blonde hair and black eye make-up, clutching the lyric-sheet of the song, annotated and underlined. Chris Lowe, Stephen Hague and I began to consult with the legend about how to sing our song and she was very nice, surprisingly a little lacking an self-confidence. As if by telepathy, a Dusty fan appeared on the studio doorstep and was invited in to listen. Dusty’s English secretary arrived bearing a new compilation cassette. ‘They keep repackaging the old songs,’ the legend marvelled. Then she went through to sing. Her voice was the same as ever. When she sang her solo part  ‘Since you went away … ‘  everyone in the control room smiled. She sounded just like she used to. Breathy, war, thrilling. Like Dusty Springfield. ‘Is that the sort of thing you want?’ she asked. Later, we chatted in the studio about how she loves all the recording technology (if only they’d had all that years ago when you couldn’t get the sounds you wanted); about how she had laryngitis throughout the recording of Dusty In Memphis, and that’s why she sounded the way she did. She chuckled, then said she was jet-lagged and went back to her hotel. ‘No one’s interested in her any more,’ someone at our record company had complained when we first announced our intention of recording with Dusty. But in the restaurant where Chris and I had dinner that night, they were playing a cassette of A Girl Called Dusty, her first LP from 1964. Twenty-three years later, people are still listening.